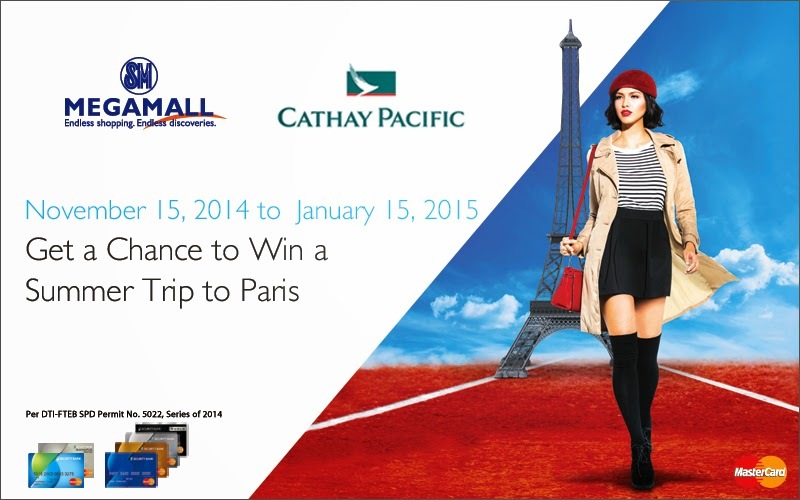 Trip to Paris w/ MasterCard ~ Philippine Freebies, Promos, Contests and MORE! Get a chance to win a summer trip to Paris with your MasterCard today. Every P5,000 single or accumulated receipt/s purchase transactions from any store at SM Megamall using your card entitles you to one (1) electronic raffle entry. To qualify and get your e-raffle entry/ies, you will need to register your valid purchases online or at any SM Megamall booths first. Accumulate as many e-raffle entries as you can for more chances of winning a trip for two (2) to Paris inclusive of 4D/3N Luxury accommodation, professional makeover, airport transfer to/from hotel, photo shoot around Paris' iconic sites, private tour of the Louvre, dinner atop the Eiffel Tower at the acclaimed Jules Verne, dinner in a trendy parisian restaurant, and passes for a Fashion Event featuring its latest collection.